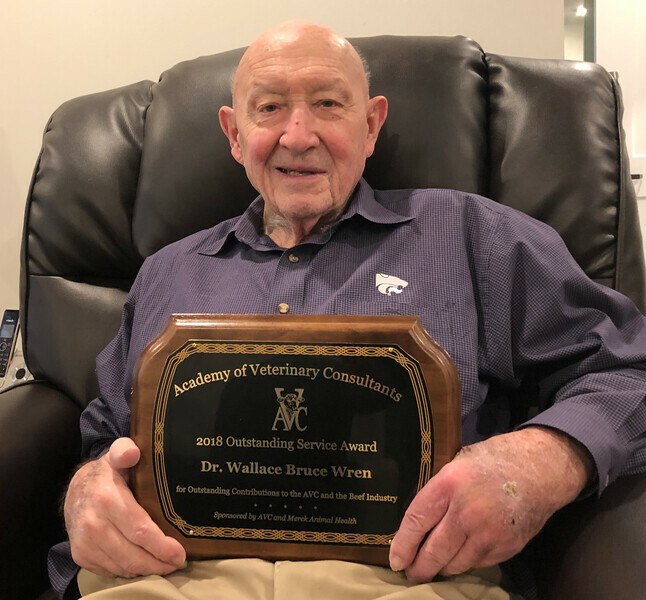 During the recent Academy of Veterinary Consultants winter conference in Kansas City, AVC and AgriLabs honored Dr. W. Bruce Wren with its Outstanding Service Award, recognizing more than 60 years advancing bovine medicine and mentoring generations of young veterinarians. Wren graduated from Kansas State University's College of Veterinary Medicine in 1958, and served as a U.S. Army Captain and Post Veterinarian at Fort Jackson, South Carolina from 1958 to 1960. He then returned to K-State to teach pathology and complete a Masters degree. He practiced in Kansas and served as a technical services veterinarian and pathologist with Armour-Baldwin Labs in Omaha. Returning to K-State in 1965, he taught pathology and completed a PhD in veterinary pathology. He then worked in industry, started his own pathology service and spent about four years with the University of Nebraska Veterinary Diagnostic Lab. Wren then spent 18 years as a technical services veterinarian with Pioneer Hi-Bred in Des Moines, Iowa, Sanofi Animal Health in Overland Park, Kansas, Rhone Merieux Animal Health, Merial in Athens, Georgia and AgriLabs in St. Joseph, Mo. 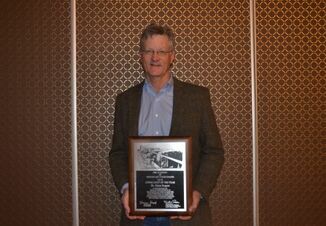 Since 2009, AgriLabs has partnered with the American Association of Bovine Practitioners (AABP) to support the Dr. Bruce Wren Continuing Education Awards, which provide two veterinarians – one in beef practice and one in dairy – with grants for their continued education. Over his long career, Wren has served in leadership positions with the American Veterinary Medical Association (AVMA), American Association of Swine Producers (AASP), American Association of Industrial Veterinarians (AAIV), Nebraska Veterinary Medical Association (NVMA); Kansas Veterinary Medical Association (KVMA); Iowa Veterinary Medical Association (IVMA), Georgia Veterinary Medical Association (GVMA); American Association of Veterinary Laboratory Diagnosticians (AAVLD), Western Veterinary Conference, K-State Veterinary Medicine Alumni Association, AABP and AVC.